Porto, situated on the banks of the Douro River, is one of the oldest cities in Europe. Sloping steeply down towards the river with its remarkable bridges-one of them designed by Gustave Eiffel-it has been an inspiration to a variety of artists. Porto made its name over two centuries ago because of its connection with the Port wine industry and has been visited over the years by many eminent people-making it one of the oldest tourism destinations in Europe. The world famous Port wine originated from the arid slopes of the Alto Douro region and is the product of a wealth of natural resources unique to the area. Once the first production stage is complete the wine is transported down river to Porto. It is here, in the famous cellars on the Douro River opposite the city, that the Port wine is finally made ready for consumption. 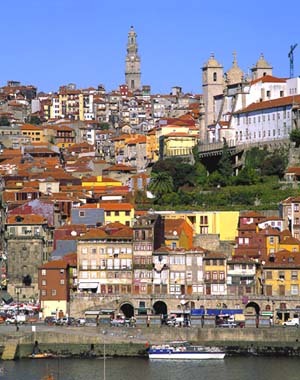 Porto was founded in the Middle Ages and has developed since them from the northern margin of the Douro River. The old quarters, right on the banks of the river, present a striking picture of architectural harmony and urban planning which, on their own, justify the city's wish to be granted World Heritage status. Many areas in Porto, well planned and landscaped, have been dedicated to leisure. Gardens, waterside esplanades, sophisticated and attractive shopping areas, and excellent sports facilities are just some of the amenities available for people to enjoy themselves during their free time. The cultural life of Porto is found not only in its historic building that link the past to the future, but also in institutions such as the S. Joao Theatre, the Casa de Serralves, the Romantic Museum, as well as the permanent exhibitions and long running shows they host, which provide the city with a rich cultural life. Porto has a rich variety of monumental and artistic heritage which is well represented in some outstanding examples of baroque architecture, such as the Churches of S. Frnacisco, Santa Clara and S. Joao da Foz, where the splendour of the gilt carvings covers the granite, or in the vast panels of Portuguese tiles of the Church of Carmo and Capela das Almas. Some of the examples of the buildings that make up the city's architectural patrimony include the iron bridges, the Town Hall, the S. Bento train station and the Clerigos Church. The latter, built by the Italian architect Nicolau Nasoni, is perhaps the most emblematic monument of this particular heritage. Today, renowned Portuguese architects continue to leave their mark on the city.